This is the best example of the two Obsidian Clovis points that were found in the Fenn cache. The other point was broken in half and only the base was recovered. 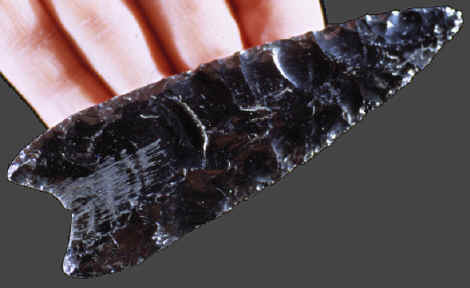 This Clovis point is unique for the scratches in the hafting area. These surface abrasions were evidently made to allow for a more secure attachment to the handle, foreshaft or spear shaft it was originally hafted to. Roughening of the hafting area on Obsidian Clovis points has been observed over a wide area in the western U.S. Some of the original hafting glue or "mastic" was discovered in the hafting abrasions on a Clovis point found in Oregon. 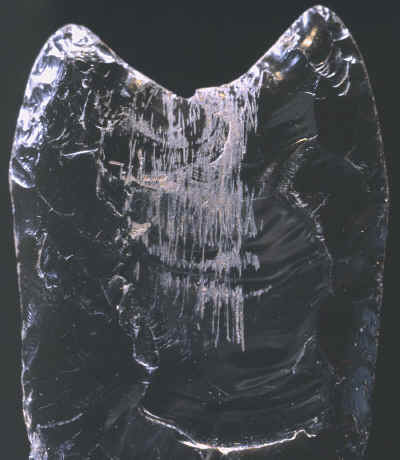 This Clovis point is made of black opaque Obsidian and measures 4 3/8 inches long. This picture shows a magnified view of the abraded area in the hafting area of this Obsidian Clovis point from the Fenn cache. 1999, Bradley, Bruce and Frison, George, "The Fenn Cache, Clovis Weapons & Tools", pp. 19 & 32.